With GPT disk popularizing, many people are trying installing windows on it, but some of them encounter some troubles that windows can’t be installed on GPT disk. Does GPT not support windows? Or does GPT disk have some shortcomings? The answer to those questions is apparently no! Actually, after you converting system disk from MBR to GPT, it has some more advantages than MBR disk. But if you don’t know some notices, you would complain and blame GPT disk. What should we do before installing windows on GPT disk? 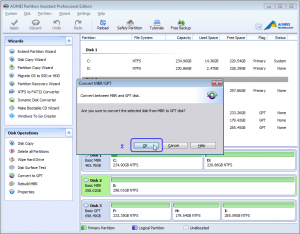 Your hard drive partition style must support either UEFI mode or legacy BIOS-compatibility mode. There is nothing to worry about before you pay attention to such things mentioned above. In view of advantages of GPT disk, we can convert system from MBR to GPT. We can do that by disk management in windows explorer, but we have to clean all data and files in system disk. So, third party software is a better choice. We can convert system disk from MBR to GPT with AOMEI Partition Assistant which can preserve all data and files in the disk. Download AOMEI Partition Assistant first, and then you can use the software: AOMEI Partition Assistant Professional Edition or Server Edition to realize this conversion. For more accurate steps about ‘how to convert system disk to GPT’, you can click this. After we finishing steps above, and paying attention to details and precondition required by GPT, we will know it is easy to install windows on GPT disk.